To complement the article “Fascia: The Matrix Reloaded,” in the July 2014 issue of MASSAGE Magazine. New studies of the microstructure of bone reveals about 2 percent of bone is fluid; a citrate goo that interfaces between the collagen mesh and the nano-platelets of mineral salts. The dried bone you find in the woods or the biology lab has lost all its collagen; only the mineral salts remain. But that’s only half the bone—about 75 percent, to be more exact. If you soak a bone in acid, like a chicken bone in vinegar, within a few days the salts will dissolve and leave behind a collagen mesh. Unless your teacher did this in seventh grade, most of us have never seen this tensile network in bone. This resulting mesh is gray, very resistant to tearing, the same shape as the bone, and so malleable you can tie a knot in it. This structure provides a much more resilient structure for bone, allowing the nano-platelets to bend and bounce a little on each other. This structure resists fracture much better than a solid bone would. 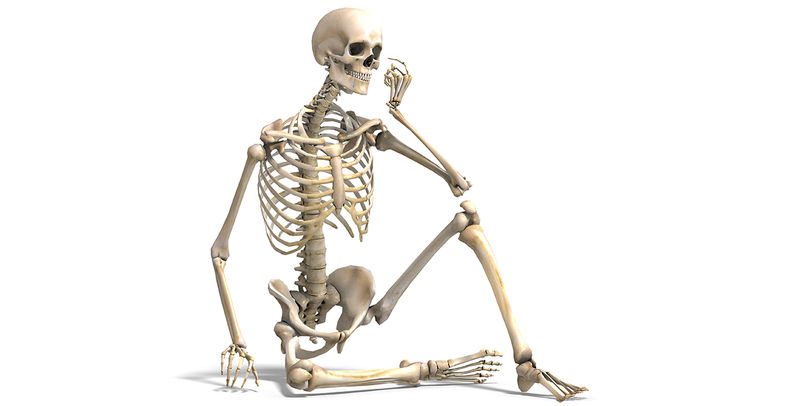 In fact, osteoporotic bones do not only have less calcium, they demonstrate less citrate as well. Fractures can propagate more easily along solid bone than they can along bone where each nano-platelet (nickel) is held apart from each other by the thin layer of fluid citrate (detergent).